Capture One Pro 9 offers an end-to-end capture, organize and edit workflow for pros, with extensive editing tools and high quality results. It's not cheap, though, and doesn't support plug-ins. Capture One made its name as a professional solution for tethered shooting when using Phase One and Mamiya Leaf medium format cameras. The camera is connected by cable to a computer, which you use to compose images, adjust camera settings and carry out quick post-shoot enhancements. Nine editions down the road, it's still a strong facet of the program, with seamless tethered shooting facilities that now extend to compatible Canon, Nikon and Sony cameras. Not only do you get 'live view' on the comparatively big screen of a notebook or desktop computer, for accurate composition, focusing and exposure adjustments, but pro photographers can also use it to liaise with remote clients during a shoot, with the aid of Capture Pilot for iOS. Online sharing over the web is also supported. As well as merely capturing images, the program has powerful organizational tools to create a library of your shots. Indeed, the suggested method for organizing your complete collection of images is by creating a 'Catalogue'. It's certainly a comprehensive way of going about things, but for large collections of pictures, expect a long wait while the program trundles through all your folders and sub-folders, creating previews and thumbnails as it goes. With options to create fully fledged catalogues, quick and easy sessions, albums and smart albums, the program certainly isn't short on organizational tools. A much quicker method for organizing images is to create a 'Session'. This is intended for quick and easy access to images from a single job or event, so you can cut to the chase and concentrate on just the relevant images. Real organizational power can be measured by how quick and easy it is to find images once they're catalogued. Capture One makes the grade with high-end database tools that enable you to apply star ratings, colour-coding, keywords, dates and locations. This all comes complete with filters and search criteria, making the business of finding images a rapid procedure. Yet more options are available with the creation of albums and 'smart albums', enabling you to create collections of images that are physically stored in a variety of different folders without having to create multiple copies. In all these organizational respects, Capture One is much like Adobe Lightroom, and the similarities don't stop there. As with Adobe Lightroom, any changes and edits that you apply to files in Capture One are entirely non-destructive. The program merely keeps a list of all the required alterations and these are applied when outputting images to new TIFF or JPEG files. As you'd expect, changes that you make are kept on file so you can easily return to them at a later date. Colour adjustments include adjustment wheels for fine-tuning colour balance independently in shadows, midtones and highlights. Adjustments are divided into various tabbed panes, including colour, exposure, lens corrections, composition, details and local adjustments. Global and selective adjustments are available, the latter working on specific areas within images. Capture One really comes to life in the quality of its raw processing tools, empowered by a brand new processing engine. The first port of call will usually be the colour pane, which enables sweeping automatic and manual adjustments for curves, white balance (including special tools for skin tones) and colour balance with separate adjustments being available for shadows, midtones and highlights. 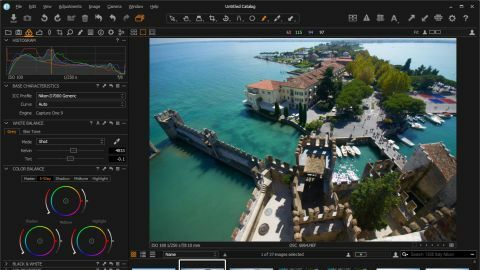 The exposure pane is similarly packed with high-end tools for exposure, contrast, brightness and saturation, along with adjustments for levels, curves, clarity and emulation for high dynamic range. The 'clarity' tool, with its variety of available methods and independent sliders for clarity and structure works particularly well. For lens corrections, many automatic profiles are available, along with generic auto corrections and options for manual adjustments. Next up is the lens pane, which includes corrections for distortion, sharpness, light falloff and chromatic aberration, the last of these complete with automatic analysis being available. Again, automation is on hand thanks to an extensive built-in library of lens profiles and you can also apply manual adjustments based on generic profiles. Sophistication extends to the provision of independent sliders for light falloff as well as vignetting, and the addition of purple fringing as well as chromatic aberration.